Rosangela Rabilo was one of the few blacks who celebrated Bolsonaro’s win in front of his house in Rio de Janeiro. On Sunday, Brazilians elected a racist, fascist, homophobe as their 39th president. Jair Bolsonaro captured 55 percent of the vote over center-left candidate Fernando Haddad. While Bolsonaro doesn’t take office until January, Brazilians are facing the instant ramifications of electing a president obsessed with machine guns and white supremacy. One Bolsonaro supporter dressed her son up as a slave for Halloween. While Bolsonaro supporters rejoiced in street parties on Sunday night; Haddad supporters—many of them black—went to sleep wondering how they would protect themselves from aggressive racism, partisan violence, deadly homophobia and the possibility of a military dictatorship even more violent than the last. “These red marginals will be banished from our homeland,” said Bolsonaro, who is a military veteran and 28-year career politician. In the weeks preceding the election, Brazilians began to see Oct. 28 as their last opportunity to save Brazilian democracy. Many posted stories on Facebook of convincing family members and friends to switch their vote from Bolsonaro to Haddad. On the campaign trail, Haddad said that he wanted to see Brazilians with a book in one hand and a signed workers’ permit in the other—meaning he wanted Brazilians to be educated and financially prosperous. A small movement arose from this—“Mais Livros, Menos Armas,” or “More Books, Fewer Guns.” During the first round vote, Bolsonaro voters filmed themselves with guns at the ballot box. So Haddad supporters brought their favorite book to the polls. Aline Martins, a high school educator, brought Abdias Nascimento’s Quilombismo. Bruno Duarte, a human-rights activist, brought Carolina de Jesus’ Quarto de Despejo: Diario de uma Favelada (The Garbage Place). For Afro-Brazilians like Anderson Moraes of São Paulo, Haddad represented the prosperity they were finally achieving through education. “It was a day of protest to prove that you could change poverty, violence and submission with education,” said Moraes, who took his 13-year-old daughter with him to the voting booth. The Paulistano brought his business school textbook and his daughter brought Djamila Ribeiro’s Who Is Afraid of Black Feminism. One Afro-Brazilian man from the northern state of Paraiba took the challenge to the next level. He voted dressed in his graduation gown with diploma in hand. But this last-minute wave of Haddad support couldn’t hold off the man who mimicked a machine gun throughout his campaign—Jair Bolsonaro. Although Bolsonaro received votes from every segment of Brazilian society—there was a clear divide between rich and poor and black and white. Bolsonaro won 97 percent of Brazil’s richest cities, while Haddad won 98 percent of the poorest. Accordingly, Bolsonaro won most of his votes in the richer, whiter south, while Haddad triumphed in the blacker, poorer north. Bahia, Brazil’s blackest state, voted 73 percent in favor of Haddad. 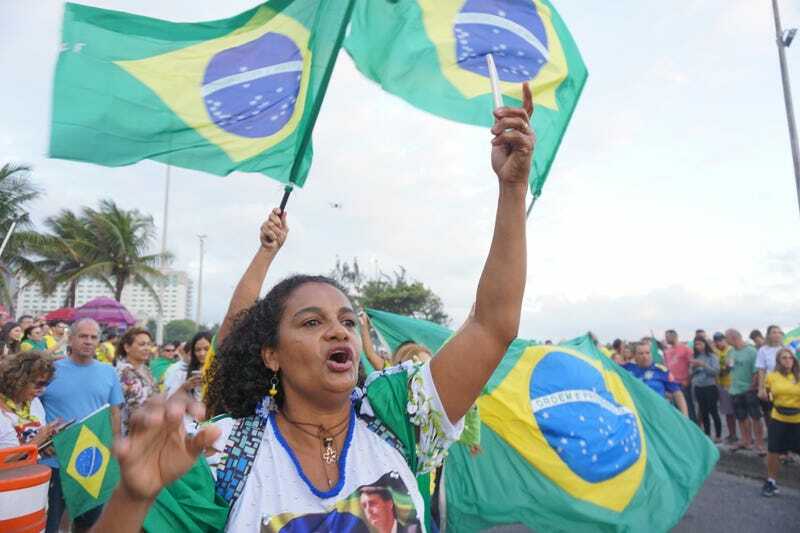 In Bolsonaro’s home turf of Rio de Janeiro, supporters, decked out in green, yellow and blue, gathered in Barra da Tijuca, known as Rio’s Miami Beach. Celia Maria Barreto and Marcos Rodrigues celebrated outside the president-elect’s house with a bottle of the best Brazilian bubbly—Casa Perini. Barreto, a local teacher, said she voted for Bolsonaro as she has seen a decline in the behavior of her students over the last 15 years. Haddad supporters, many dressed in red, gathered in Praça São Salvador, a square in Rio de Janeiro known for its left-leaning gatherings. With the votes tallied, Bolsonaro fans neared the Praça and screaming matches ensued. Although no one was hurt, several people reported gunshots. The representation of Afro-Brazilian politicians improved slightly in 2018, according to Alma Preta, a black news website. Blacks (including mixed-race) made up 46 percent of the political candidates throughout the country. But only 125 of the 513 federal deputies self-declare as black, an increase of just five percent. Brazil elected only one female governor, Fatima Berreza, a black woman in Rio Grande do Norte. Fifteen self-identified black and mixed-race senators have been elected. The number of dark-skinned black senators elected tripled from one to three. Rio de Janeiro elected three black women to its state congress. Renata Souza, Monica Francisco and Dani Monteiro worked for slain councilwoman Marielle Franco and decided to run for office in her memory. For the first time in the history of Brazil, an indigenous woman was elected to Congress, Joênia Wapichana of Roraima. On Monday morning, many left-leaning WhatsApp groups fell silent, perhaps a sign of the lingering shock that people suffered the night before. Afro-Brazilians changed their Facebook and WhatsApp profiles to an all-black version of the Brazilian flag. Massive protests are planned for Oct. 30 throughout Brazil. “This moment is exactly the moment where the Black Movement in Brazil should unite and assume this fight against Bolsonaro,” Rosas said.